The Greenville Chorale is very excited to open the season with a little “high lonesome” and “swing” in our step. 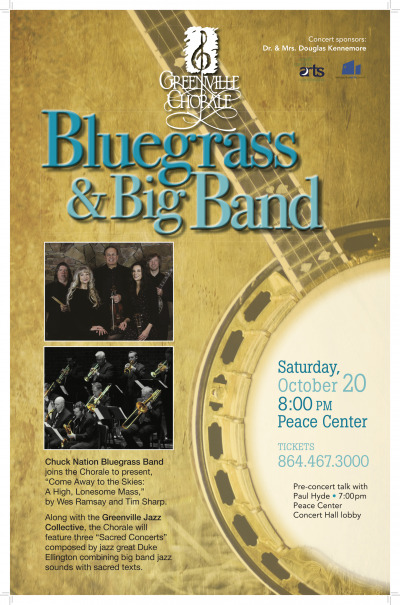 The program will open with “Come Away to the Skies: A High, Lonesome Mass,” which has enjoyed national acclaim as a wonderful example of the bluegrass mass genre. Joining the Chorale will be the incredible Chuck Nation Bluegrass Band from Gainesville, Georgia. The second half of the concert will feature music from the three “Sacred Concerts” composed by jazz great Duke Ellington. The Greenville Jazz Collective Big Band will join the Chorale for these works that combine big band jazz sounds with sacred texts.